A wonderful morning again this day and no rain at all this day. I tried to get away reasonably early, but guess this is still around 9 am for me. 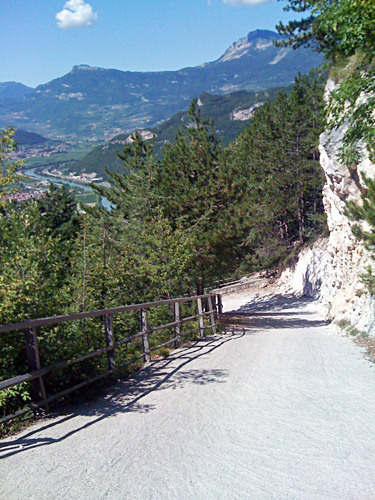 I had decided to take the easy road over Vigolo Vattaro (725m) (a pass) and then go down south in the huge valley between Verona and Bolzano. 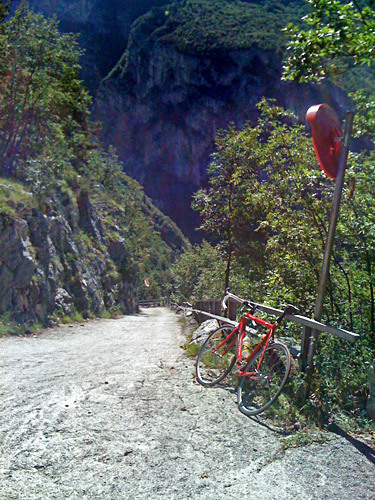 Early on up to Vigolo Vattaro I got company with a local cyclist so I got warm and even went away from him before the top. 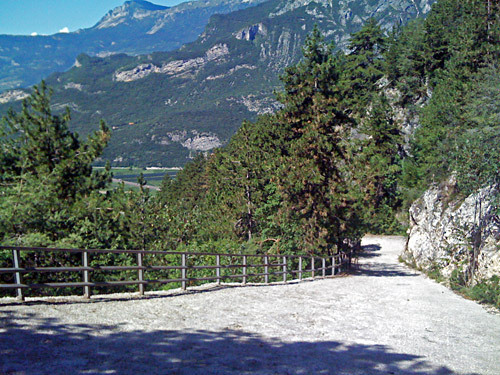 Then I headed down toward Trento, but took off on a small road down to south of Mattarello (195m) (the first photo is from the narrow passage through Mattarello di Sopra). Now the main road down here is pretty boring and trafficated, but after a while I remembered that I had thoughts about going up in Besenello to the start of the steepest paved road in the world Scanuppia - Malga Palazzo (or at the very least one of the 10 steepest, depending on over how long distance one talks about). I know both that it would be too steep for a road bike and had advised a guy against going here earlier this year and now felt a bit like betraying him, when I myself now wanted to go there. 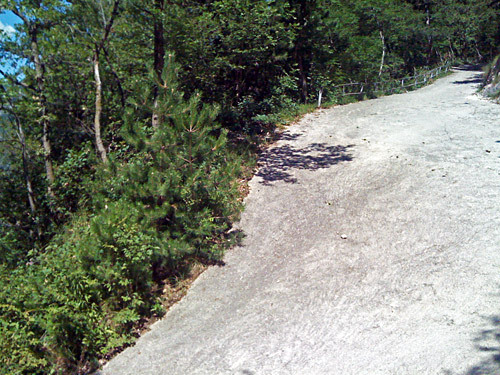 But also that it is not allowed any longer for bicyclists, since it became common knowledge that this was perhaps the hardest climb anywhere (there are some other challengers though) and cyclists came here and caused an additional hazard for the people using it with 4-wheel drive vehicles and for the cyclists themselves. Yes, let’s get up and have a look at the classic 45% warning sign, I thought, and then go back. I went into the village and soon found the way out in the right direction. 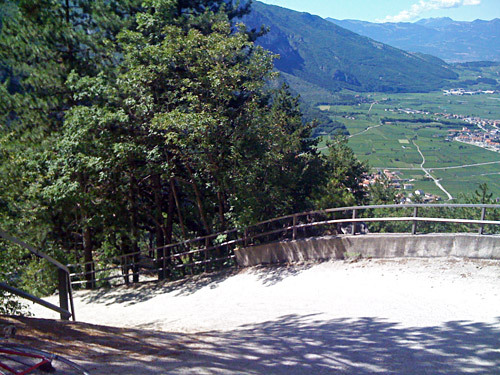 The road to the start of the steep road is quite steep itself with up to 16-17% and climbs quickly 100m. Just as I arrived at the sign announcing that cyclists are forbidden to go up here and the 45% sign, a Jeep arrived with two men looking serious and who stopped to tell me the obvious – that the road was forbidden to cyclists and that it would be dangerous and totally unsuitable for my kind of bicycle. I told them that I knew and that I was just curious to see the start of the road. Then they got a bit happier, but just as they were about to take off, they stopped again to ask me if maybe I wanted to see more of the road and they offered to take me along on the Jeep. Why not, I thought – how could I possibly say no to such an offer. It was not like I would have wanted to try the road with my road bike anyway, because it was quite clear to me already at the start that it would not be worth the trouble and that I would not get many metres up there. They had no straps for fastening my bike on the top of the car, but oddly enough it turned out that it was possible to place it so that it did not get any damage, nor would it move and it actually stayed perfectly on the roof all the way up. I jumped in and we set off. This was cool! I went up in a Jeep on the Engineer Mountain in Colorado (2007) with an experienced driver on an hilarious road (and bad one), but this road was more hilarious in terms of its steepness! They could make it a profitable tourist attraction without any doubt if they so wanted. They lived up along this road in a little house (with good views) and there were some more houses up here too. I stopped for a coffee at the house and we talked a little. 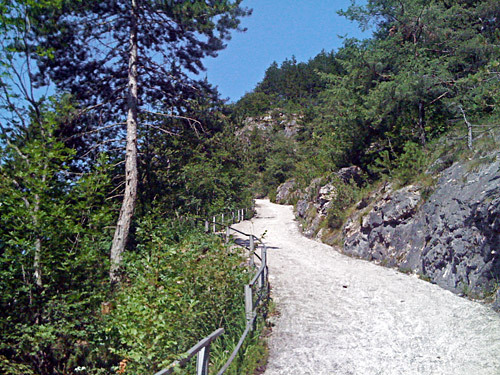 There is actually quite a climb left up to the end of the concrete pavement (it is too steep to use asphalt on a road like this), but it felt rather uninteresting in comparison to the steepest section that we were above. I see on the profile for the climb that it is never less steep on average than 13.2% and still it felt like the road was pretty flat around where they lived. They warned me a thousand times of not trying to cycle down back again (as if I did not understand the problem) and I promised I would be careful and walk most of the way down. We had some photos and I thanked them and said goodbye. Quite nice people! I explained that I intended to get up to Passo Bordala, which we could see from their window, but later I had to realise that I had spent too much time up here to be able to make it over the Bordala pass (but I am not sorry for that). I cycled down to where the steep part starts on the bumpy concrete (deliberately made uneven to make it possible to get up with a car). Then I stopped to take lots and lots of photos on the way down. Now I was really sad I had no more film with me (last photo was the first one on the page here and I only had my old bad iPhone camera here and for two days now). 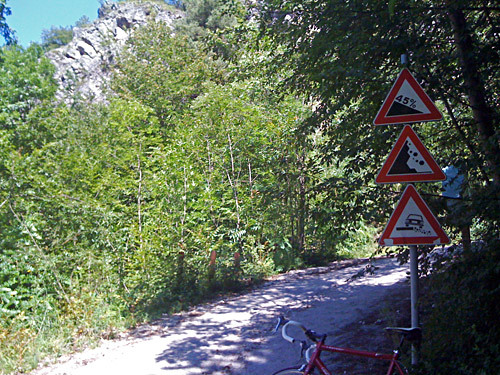 I did try and cycle part of the steep road down, but had to get off before it was too late (really not recommended to try this!). Here one MUST have disc brakes as ordinary brakes are simply no good. I heard some squeaking sound from my brakes at one time and was worried they would break down (I am not overstating this). I had two cars coming down and one of them (at the top) also stopped to warn me. Actually it is pretty dangerous walking down here in bicycle shoes as I did as the concrete is a bit shiny and could be slippery. However, 45% is a bit more than you will find. Like some have said, maybe it is 45% in one or two insides of the curves, but otherwise it is merely around 33-35% most of the time. On average I guess it is only close to 25% for 2 km, but again, you have likely never seen anything so steep, so. I remember walking down from Viderjoch between Ischgl in Austria and the Samnaun valley in Switzerland and there it was 42-43% steep ramps, but even them did not come across as much steeper than this. Anyway it is a fascinating road and I am happy that I got to see it! That was a little detour … . 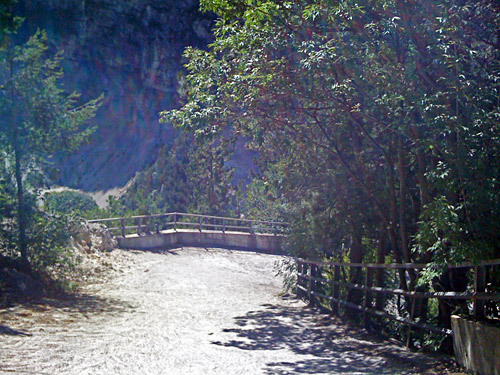 I went down Calliano (189m) to look for film, but did not find anything good. I went on and over to the other side of the Adige river to Villa Lagarina (185m), where I decided to have a lunch break and decide if I could possibly get over the Bordala pass. The climb starts right there. 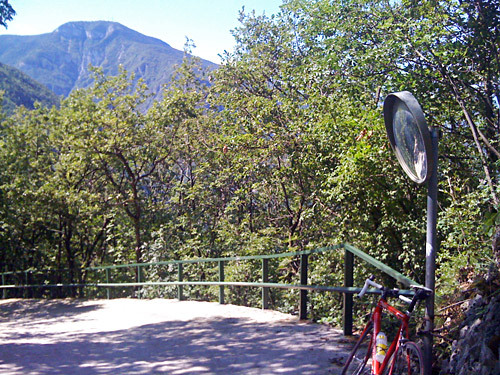 It was soon 12 now and after counting on it, it made no sense to try the Bordala pass, as I was not going to skip the climb up to Telegrafo - Punta Veleno by Lago di Garda. This was the second (or third) time I had to strike this pass out of my plan and it was disappointing, but one has to make hard choices sometimes. Feeling a bit uneasy as I really needed to stop for something before the next climb, I continued. 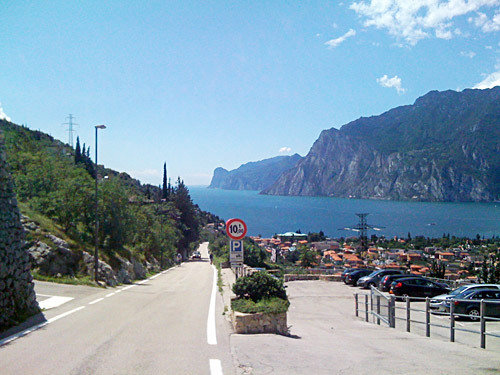 Just a kilometre out of Malcesine I found a great café with ice cream bar. A little worn down, but friendly and even the TdF on the TV running! Perfect! Now I was in good spirit again. 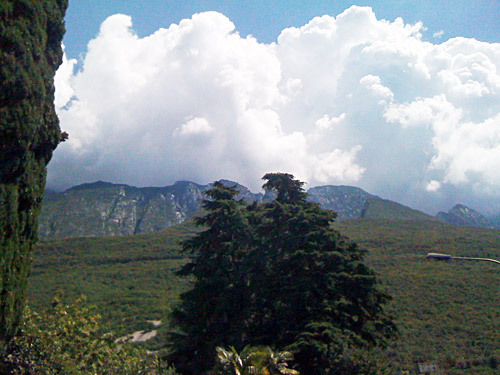 I had a photo up the Monte Baldo as it looks impressive from here (very steep up). 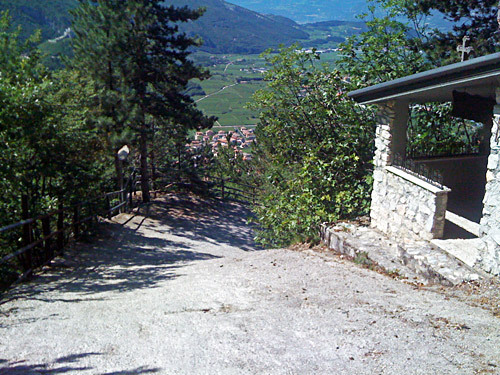 I soon arrived at Assenza (74m), where I had stopped for the first night on my first trip to the Alps in 2000 and remembered well walking on all four up in the night with my slippery sandals as the concrete path was so steep up from Sommavilla. 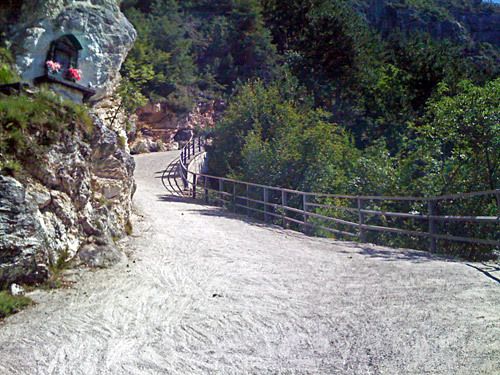 Now I did not know then that here was a road that could be continued up the mountain, not the concrete track, thanks!, but an asphalted road over to Castello di Brenzone and then up to Telegrafo - Punta Veleno (1156m). So, we are dealing with a horrible climb here! I went up in a decent speed at first, but soon realised that I better try and take things a bit easy. Soon a guy came up to me and overtook me very quickly. I speeded up a little, but had no chance whatsoever to hang on. It was a skinny guy with not even a jersey on or helmet, while I was having all my clothes and helmet on and also my backpack, so it did not feel totally fair! ;-) Soon two bicyclists came down and cheered us on. I was getting very tired very fast now and the last 10 serpentines or so was a real fight where it felt like I could not go any longer most of the time. I was close to giving up a few times, but told myself that it was not an option. One really get to test ones endurance on a climb like this and it is fun when it is over, but not all too pleasant when the struggle is on. Endurance sport is what you engage in when both your body and your brain says no, but you still continue (at least, that is my definition). 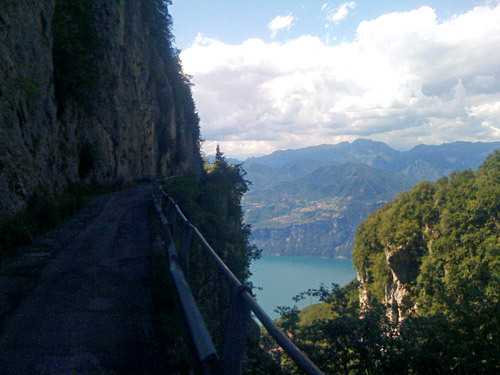 Eventually I reached the top section where it becomes flat while the road climbs the rock wall and you get a last great glimpse of the Garda lake (photo) before a short little pull up to the high point, which only has a Punta Veleno sign showing you the climbing profile and no views. The other side is on a wide pleasant road, which looks like any other road high up on mountain plateaus. The road goes down gently at first, but more quickly later on. 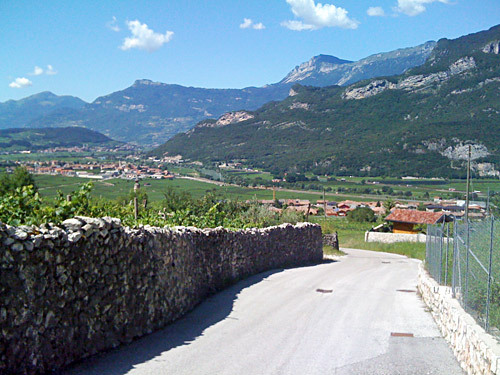 The area up here is called Prada Alta and that is also what you should look for on the sign in Castello di Brenzone! 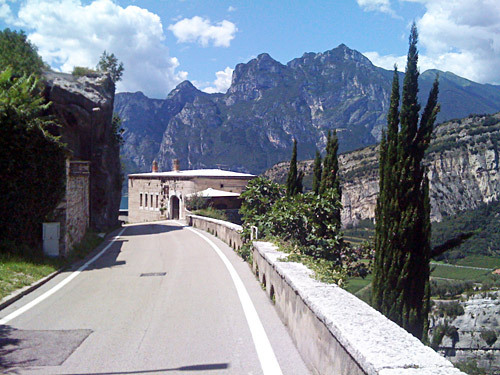 One passes at least over one pass (734m) before Lumini on the way down and if you go over San Zeno (as I did) you will pass over another pass (725m) just after Lumini (short climb). 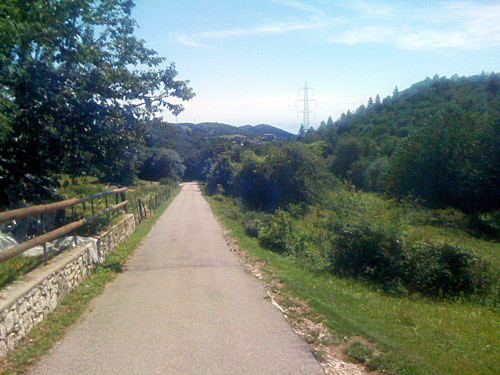 I guessed my way down, but correctly, to Garda (68m) by the lake and by taking the way I took it was mostly downhill and still I got as far south along the lake as possible when I came down. 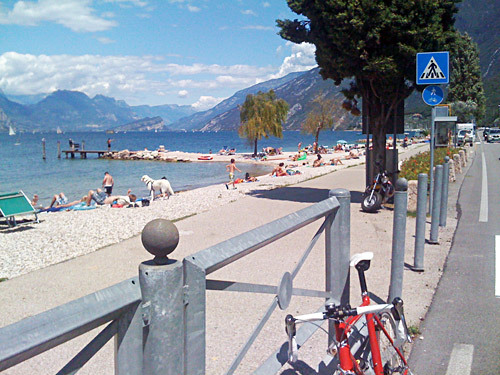 I just continued on the busy road down south and suddenly a good rider overtook me (there are always many bicyclists along the Garda lake). I hanged on to him to help me get down south a bit faster in the heat and the traffic. I was now in a hurry to catch the train in Peschiera del Garda. I had called Gabriele Brunetti the day before (or earlier) announcing that I would come one day later than expected to Milano. Gabriele had not been too happy about this as it would not be easy for me to stay there then and he was thinking of going down to his house in Liguria. 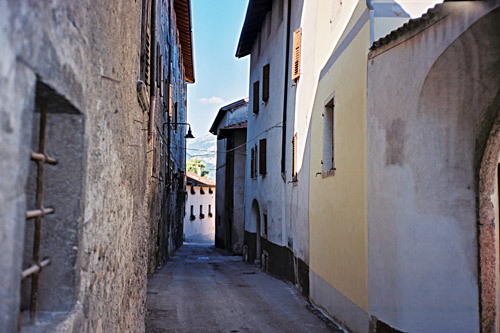 But I was going to call him again and maybe I could follow him down to Liguria he said, (if I wanted). The guy I hanged onto did not much notice me and apparently was out on a training ride with interval training and was going as fast as he could at times, but I managed to always get back when I lost him a little (not trying to outdoing myself). Apparently the guy was a pretty good cyclist, that much I noticed. We kept a great speed and a bit before Peschiera I went up to him trying to exchange a few words, but he was not so good on english. I thanked him and said goodbye. Without him I would have been there almost half an hour later, I guess. Now I was sweaty! I found the train station after asking someone and rushed in to get a ticket, but then got the surprise that there was a train strike going on in Italy all this day and few trains went as normal. I got a ticket even if warned that there might be no train coming. It was all very confused and sometimes they just refused to let passengers buy tickets at all. The train I had been in a hurry catching around 16 something was not going this day and I was told to come back an hour later to find out if the next one maybe would be going. I was lucky even to get this information. I was tired and could not do much about it so I went out. I was looking after a café with ice cream again! But I did not find anything near the station (I went in the wrong direction), but found a gas station where I got help to wash my bicycle again, which was very good before the train ride and ride to Liguria (possibly). Then I went down to the real town which was filled with cafés with ice cream! 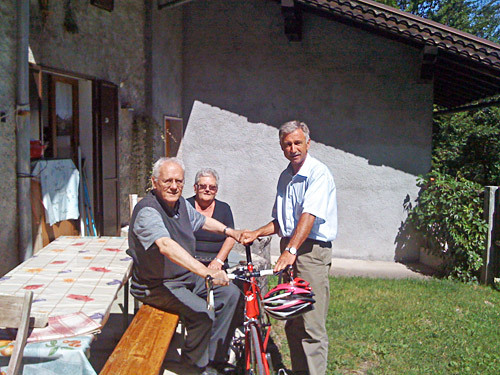 I got a good place outside with a lovely view over the Garda lake and called Gabriele to tell him about the problems. Gabriele was of course not too happy, but was nice and said I should call him back and update him on what would happen and he would wait at least for some time. Soon it was time to go back (and I also need to buy some water to bring with me on the train ride). Back at the station, it was soon evident there would be now train coming now either. I asked if there would be any more train coming this day and the answer was like maybe not. Now, being a bit distrustful of anything having with trains in Italy to do, I decided that it could just as well come a train at any time and I better get out on the right platform just in case. Sure enough. Sometime between the two scheduled trains a train came by and stopped and after a while it became clear that it was going to Milano (had to ask several people). The people operating the train seemed like they were away on some holiday somewhere and could not possibly take things more easy and slowly – they were happy and seemed like they had no clue any others were on this train more than they themselves. After what felt like a lifetime passing by, the train eventually moved in the right direction. Now it was long after 18. I called Gabriele that we were on our way and that if nothing funny happened along the way, we would likely be in Milano around 19:30 something. He told me to go and wait by the hotel (Michelangelo?). The train actually arrived without any more hiccups and I went out of the Milano Centrale (that I know pretty well by now). Last time I missed the hotel when I met with Gabriele here another year, but now knew where it was, but there are no parking places by the hotel, so I figured he would go into the parking area where people pick up people coming with the train and that he could not possibly miss seeing me there. But Gabriele really had meant to stop just outside the hotel as we would be able to get quicker out of town that way, apparently. Then I tried to call, but the call broke off and I thought he was on his way, but it turned out the cell phones were not working well in Milano. Eventually we managed to hear each other over the phones and apparently he had been waiting as long as me without us seeing each other. Very frustrating and you can understand Gabriele was not happy, and neither was I. Anyway, Gabriele is a good driver and the traffic was not as bad as feared, so we were down in Varazze by 22:00 or so. We managed to get two pizzas and got up to the house to eat and get to bed soon thereafter. Gabriele had plans for us, he told me on the way down. 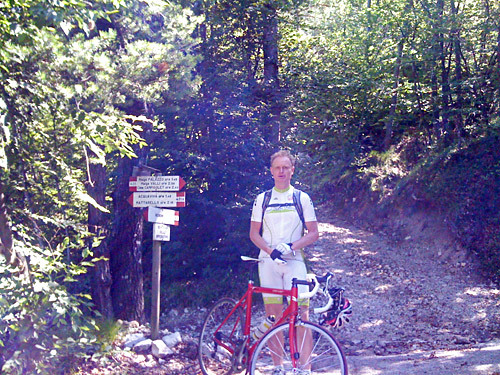 We were apparently going to go on a group ride with his ‘Olmo’ (local frame brand) group from nearby Celle. I had originally planned to stay the night at Gabriele in Milano and then take the train to Torino and continue back to France from there, but figured I could just as well take a train from Savona and up to Torino.